Who’s got long, curly, brown hair, but intends to have it braided for his next fight? 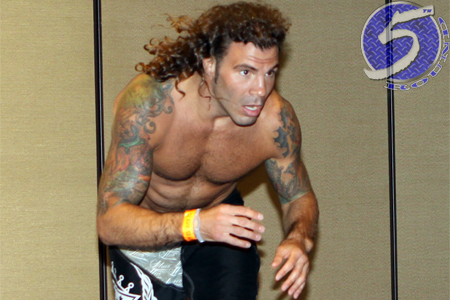 That guy (Above: Clay Guida)! According to John Fosco, Guida’s manager, Gray Maynard’s representatives filed a request with the New Jersey State Athletic Control Board a month ago stating Guida’s hairdo could cause “interference” in their shootout. Instead of demanding a hearing to protest the petition, Guida opted to go circa 2000 and don some cornrows for his bout with Maynard. “The Carpenter” understands he’s got to pick his battles and he would rather conserve his energy for the Octagon. The lightweights headline next Friday’s “UFC on FX 4” event inside Revel in Atlantic City. It will mark the first time in Guida’s big league career where his signature locks will be on lockdown. For his part, Maynard told MMAJunkie he had no idea his camp submitted the request.